This has been my proudest moment, ever! I can’t believe that I am already walking through the training college with my gorgeous cabin crew uniform. I have passed my SEP and GMT exams already and I only have three-weeks left of training. I am going to fly soon and I am extremely excited for it! GMT (Group Medical Training) has been the most difficult part of the training in my opinion. Mainly because I am pretty bad dealing with medical terms, first aid, and the like. However, the pieces of information given to us made our batch to be more confident in handling medical cases on board. I can now finally say and verify myself that being a cabin crew is not a joke nor a “chicken or beef” kind of job. The training is long and intense. All the knowledge you gain from the training college has to stay with you forever and you must learn it all by heart– as things could happen. Lastly, I received my nationality pin today and I will be very proud to wear the Japanese flag on my service coat! Hello, everyone! I deeply apologise for not being able to update my blog. I have been extremely busy with the SEP training which lasted for three weeks. My wonderful batch passed the training and we are moving forward onto GMT (Group Medical Training) today. The SEP training was hard and fun at the same time. I just could not believe that I have learnt some huge amount of information in just a span of three weeks. The operations manual that we have been using is unbelievably thick, but our trainers/instructors are just the best that it feels they are doing some magic tricks to make everything easier and squeeze every bits of information in a short amount of time. We learnt on how to evacuate the aircraft in land and in water, how to fight fire, deal with decompression, what to do during light, moderate, and severe turbulence, how to operate the door in both normal and emergency situations and its SOP’s. Moreover, the lights and sound indicators in the cabin were pretty hard to memorise, too. But one thing is for sure – amber is for lavatory! Batch 3168 – I am so grateful to have these amazing batch mates and awesome trainers! Hello guys! I know it’s been a week since I last posted an entry. Ever since I arrived here in the United Arab Emirates, my life has become really busy meeting new people, getting to know the amazing set of people in my batch of different nationalities, knowing Emirates, getting familiar with the Emirates Headquarters and the training colleges. Let me start with my joining flight. It was a very wonderful experience, and I must say it has been the best flight that I ever had in my life! The cabin crews on my flight invited me to the galley few minutes after the meal service and had the chance to get to know them, some useful insights, their experiences, and the best of it all – sitting on the jump seat. Mood lighting of Emirates Boeing 777 aircraft. It was an 11-hour flight from Tokyo all the way down here to Dubai. I gazed outside the window as the plane is doing its final approach, I was stunned with the spectacular views of the UAE – from the green lushes and to the deserts. I was welcomed by the Marhaba Staff and cleared the airport. As I reached my accommodation, which apparently is a hotel, I was so overwhelmed and could not believe that I am finally here and so happy to be here. The United Arab Emirates is such a wonderful country, truly a melting pot of cultures from all over the globe. I will be back for more photos and entries on my next day off. For now, I will need to prepare myself for the SEP training – which will start tomorrow. So today is my joining flight, which is actually a red-eye via Emirates flight EK313, a non-stop service from Tokyo Haneda to Dubai. I am writing this one while waiting to board this gorgeous-looking Boeing 777-3ooER and I am preparing myself for a long 12-hour direct flight. I have never seen an actual Emirates plane as close as this before and I am so stoked about flying in it for the first time! I promise to take a handful of photos and share it with you as soon as I get there. Meanwhile, I am sort of getting emotional thinking that I am going to be away from my mum for quite some time and from my country as well. I also never thought that I would be stepping foot into the Middle Eastern soil. It is truly unbelievable and surreal that tomorrow I am gonna be waking up in Dubai. Farewell and good night to you, my beloved Japan. And see you in the morning, United Arab Emirates! PS: This will be my final entry under the ‘Cabin Crew Application Process‘ category as I am going to publish my new posts under ‘Fly with Ichi‘ from this point onwards. Good day, cabin crew aspirants! First of all, from the very bottom of my heart, thank you so much for giving me your time in reading and visiting my blog! You guys are all wonderful. I started blogging last September 2015 and since then I noticed that my site is getting numerous attentions and increasing visitor counts. 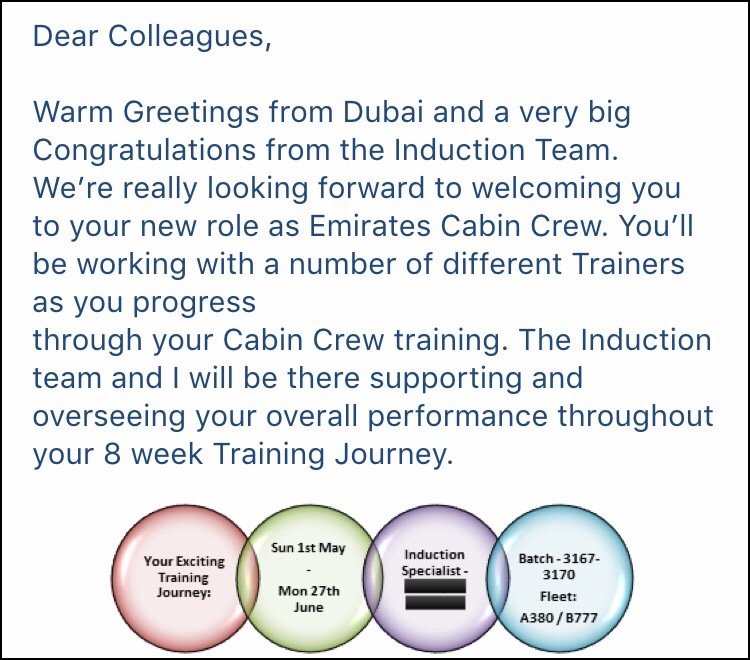 This means a lot to me because I have never done any serious blogging in my life until my journey to becoming an Emirates Airline cabin crew took off. My main reason for putting up this blog is to help. I am not doing this for the sake of becoming popular or whatsoever since I am really not an expert in blogging. I want to inspire people. My wish is for you to look at me and say, “because of you, I didn’t give up.” Weeks before I went to my Assessment Day, I scoured the internet and read every blogs to get more tips and pieces of advice in getting through the selection process. Like a student, I did my homework and came to class prepared. Everybody has their own journey and story. Mine was a mix of every cabin crew bloggers’ dreams, and experiences. Those blogs I have checked were a huge part of my success as an applicant. Big thanks to those people who delightfully and generously shared their ideas and own experiences as a cabin crew of Emirates Airline, especially to Lupè Love from the beautiful USA, – who inspired me the most to put up my own blog. And now, I would like to pay it forward. “Thank You So Much!” – really, these four words are not enough to show how grateful I am to everyone who helped me along the way. Every day, I am receiving messages from my readers asking for tips, pieces of information, and “thank you” emails. You guys have no idea of how much happiness it brings me every time I see you writing back at me. It really touches my heart knowing that I am able to inspire other people and make them believe that dreams do come true, and yes it really does! Patience and resilience is the key. It would be my pleasure to help every aspiring Emirates cabin crew applicants because I was once like you. My wish is for everybody to get into Emirates. The whole process was not a walk in the park. I also failed at one point but all I can say is to never give up when you know that your dream is on the line. I wish you guys all the best. Enjoy the process and the journey. Because that is the part where you can actually say that every hardship you endure is all worth it. So ladies and gents, you are also welcome in advance. Now, I am embarking on a new journey as I will start my Cabin Crew Ab initio training in few days time and I promise to keep this blog running – probably with quick and shorter updates as things might get very busy. I would also like to take this opportunity to promote my Instagram since this is the only social media platform that I am constantly connected with. Please follow me at (@ichikun25). Anyway, I hope you will still continue to drop by and join my adventure in the Land of Emirs and Sheikhs! Once again, thank you from the depths of my heart for reading my blog. Before I wrap up and bid farewell to my ‘Application Process’ category, I would like to share my timeline below in full details starting from the day I applied. I divided it into “categories” to make it organised and less confusing for you. If you are currently on the waiting pool, please do not compare your timeline to me or to anyone since each and everyone have different cases; specific language requirement is an example. Moreover, please make sure to visit the Sitemap located right on the menu to view a rundown of my entire application process and for quicker link access as well. My most awaited email regarding the batch number and fleet allocation information from our training specialist has finally arrived today! I am very excited to meet my future batch mates in Dubai. Also, I am going to be trained with the Emirates’ flagship aircraft – the “King of the Skies” Airbus A380, along with the “Bigfoot” Boeing 777! I only have two more days left ’til my joining flight and I am experiencing mixed feelings of excitement, happiness, nervousness, and sadness. I am trying my best to stretch out each moment to delay my farewell ‘cos I am going to miss my mum and Japan so much! I just received my accommodation information and apparently, it is a hotel. Getting a hotel accommodation means it will just be a temporary one. But nevertheless I am really happy and this news made my day! I just received my ticket and UAE visa today and I am quite surprised to see that my date of joining has been moved one day ahead of my original DOJ, which was supposedly on the 29th. I feel happy and sad at the same time. Happy – I am going to have two days of rest in Dubai. Sad – I will lose one day of stay in Japan. Nevertheless, my excitement is all over the place and I can’t wait to know where my accommodation will be!